DELICIOUS VANILLA KETOGENIC COFFEE IN SECONDS - Just blend our keto-friendly creamer into your coffee and enjoy! Makes an easy Butter Coffee! The PowerCreamer is a liquid blend that is made with premium ingredients. Promotes instant energy through the day. Use in hot or iced coffee (just blend in hot coffee first). Can be a stand-alone breakfast (including while fasting), or blended in shakes, smoothies, or tea. For a bonus punch, add collagen peptides, protein powder, cacao, or cinnamon. 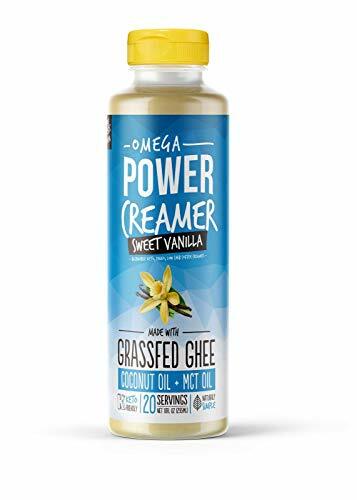 ORGANIC, GRASS FED, & NATURAL INGREDIENTS - 100% Grass fed Ghee (Clarified Butter), Organic Fair-Trade Coconut Oil, Medium-Chain Triglyceride Oil (MCT Oil), Natural Vanilla Flavoring, Organic Stevia Extract, and Non-GMO Sunflower Lecithin. Sugar Free. Lactose Free. Casein Free. Healthy Fats. Zero Carb. Gluten-Free.